Popular award winning Nigerian artist Tuface may be set to reach even greater heights, his recent tweets hint that he and the extremely popular multi-award winning Akon may be working on a project. 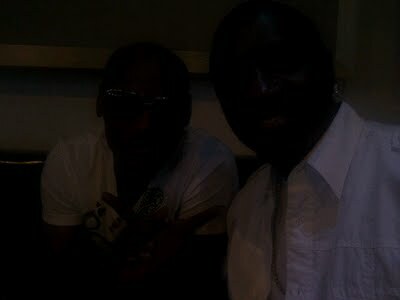 The singer tweeted a pic of him and Tuface and wrote: Me and @2faceidibia working on a master plan in Atlanta! The world is not ready! African Connection. Akon has worked on songs with music greats of the caliber of the Afro-American Legend Michael Jackson and is one of the most popular artists of our time. If the speculations arising from this hint are right, we might just be seeing an even bigger collabo than D’banj and Kanye West. Mariah Carey Shows Off Her Cleavage For Christmas But No One’s Impressed! Nigerian Actress, Chika Ike goes back to school. Thank God 4 him. Wishing him d very best n more collabo with bigger artist.